Launch: Sandy Point State Park is designed for boaters. There is a row of excellent, and well-used, ramps. Comments: Perfect put-in for the bay, since you are close to some of the crème de la crème anchorages, towns, and cruising rivers. -----"What a cruising ground." We were looking at the chart book of the Chesapeake. It was impressive. "This is a Bay with ancillary bays. It has rivers with tributary rivers. There's no end of cruising here," I said, overcome with the possibilities. 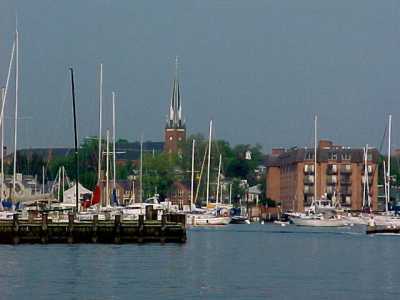 -----"And there are picturesque towns and restaurants with great seafood," added El. 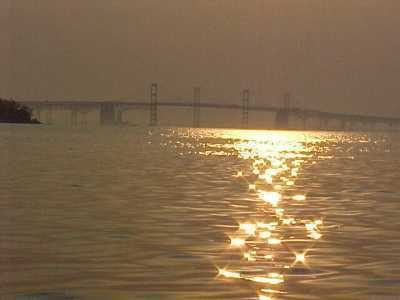 She had been reading the guidebook, as well as Beautiful Swimmers, the book describing the lives of crabs and the Chesapeake watermen who pursued them. "Beautiful towns, historic sites, an interesting culture, and thousands of marvelous anchorages - we could be here for months." -----"Hmmm, thought we were going to head north to have more time in the far reaches of Canada?" I reminded her. -----"Right," came the jaunty answer, "but how about a week here first? It will give us a flavor of the Bay and entice us to return." 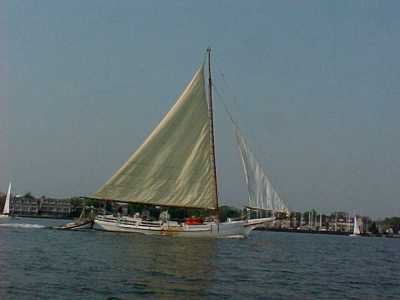 -----We cruised a week on the Bay - and it was a marvelous appetizer. We visited Annapolis and St. Michael's, went up the Chester River to Chestertown (where they have their own reenacted Tea Party. They claim it predated Boston's Tea Party). We explored the river Wye and it's neighbor, East Wye, and had some nice cruises on the Bay itself, under the big bridge. We hooked in Whitehall Creek, Drum Cove, Dividing Creek, and a few other delightful spots. -----One night, we had a dreadful experience - MOB. It is every boater's dread - MOB - Man Overboard! Imagination adds many embellishments to stories told by skippers over a tot of rum in a thousand darkened cabins. The non-swimmer who is gone in a trace. The man relieving himself over the rail at night, boat on auto-helm, who loses balance with an unexpected lurch from a wave and is thrown overboard. He desperately tries to swim back to his boat as it cruises unknowingly away into the darkness (in most male MOB drowning, the man's fly is open). The spouse who awakens to relieve his mate from her watch and finds no one at the helm. The small - oh, so very small - head of a crewmembber, overboard in a storm, disappearing aft into the spray and waves. -----El and I long ago decided there are rules to be obeyed on a boat. One such - if we are standing a watch alone (even in a flat calm), we always wear a lifejacket, with strobe light and whistle attached, whenever we leave the cabin. Another - again, if leaving the cabin, the PFD is worn when there are small craft warnings or enough of a sea that we have to hold on to keep balance. The horrible tales of MOB ricochet in our head. -----The VHF is always on when we are underway. It is bothersome, with boats hailing each other, commercial traffic chatting, and sometimes kids squealing. There are, however, times when the radio carries essential information for us live-aboards. There is the twice-daily routine - breakfast and before anchoring at night - of listening to Arnold on the NOAA weather frequency. Contrary to shore folks, we don't pay much attention to rain or sun, high temperatures or lows - we focus on only a few of "mush mouth's" predictions - wind speed and direction, and the movement of frontal systems. Our lives are lived around weather. Our daily travel plans depend on the winds and arrival of fronts - and our choice of anchorage and the comfort of our nights predicated by the direction of the wind. -----The other transmissions that immediately arrest our attention are usually from the Coast Guard - "Securité Securité," comes the commanding voice. A nice way to say, "Listen Up." These are routine messages but worth noting. Then, there is the more alarming, "Pan Pan, Pan Pan." This is a safety message that might affect us - a ship leaving an anchorage, or a boat adrift. The transmission most dreaded, though, is "Mayday! Mayday." We have only experienced Mayday three times thus far in our cruising. -----The first time, we were the ones declaring "Mayday! Mayday!" into the airwaves. We were on a friend's 45' commercial fishing boat, with twelve people aboard. We were in the Great Southern Ocean south of New Zealand, when the engine room caught fire. The captain bolted from the helm to try to put out the fire. El and I were alone on the bridge. There were no life jackets or lifeboats and most of the crew couldn't swim. The water was freezing cold anyway. The engines were dead, and we were drifting, broadside to humongous swells, down onto a small, ragged, rocky island outlined in boiling surf. There was no anchor. Smoke poured from the hold, the crew was panicking, and I continuously broadcast a Mayday. There was no response. Over and over I called the Mayday. Between calls, waiting for an answer that never came, El and I calmly discussed our plan of action. Remain on the radio and helm until she grounds - then, together, off the stern on the back of a roller and swim together for shore. A hundred yards off the maelstrom, an engine coughed into life. We throttled lightly forward and spun the wheel to safety. So much for Mayday. -----The second time was in a Pacific storm. We were safely in harbor when the VHF blared the Mayday. A commercial fishing boat was filling from a burst water pipe off the southern California coast. The Coast Guard answered immediately, and within a few minutes, a helicopter passed over us bound for the vessel. They lowered pumps to the boat. She made it into our harbor, accompanied by a patrol boat. 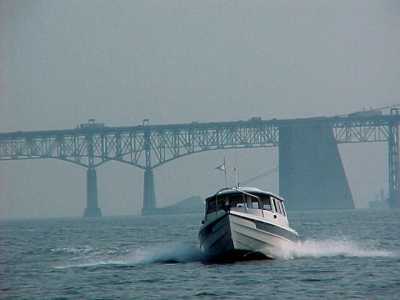 -----The third time was on a windy, stormy night on the Chesapeake. We were in a snug anchorage, waves lapping gently on the hull, swinging wide arcs on the anchor with wind humming under the radar dome. We were quietly reading. I put down Michener's Chesapeake to check NOAA for one last weather message before turning in. The VHF came on to channel 16 and I caught a Coast Guardsman asking the skipper for details of his MOB Mayday call. 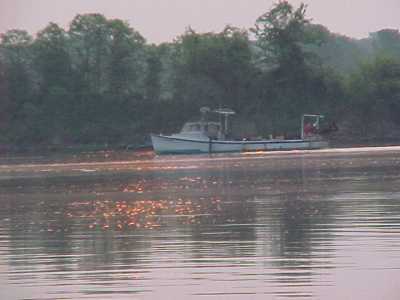 -----"It's me son - slipped overboard while dumping the net - just happened - can't see him out there - he's wearing heavy boots - can't swim - don't see him," came the frantic voice. -----The Guardsman finally got a chance to ask - "your location?" Back came the frightened voice describing the spot. -----Then, the awful words, "I'm going over for him - gotta find him." -----The Coast Guard tried to reestablish contact for another hour and more. The next day, they recovered two bodies.